Almyra, which means salty in Greece, is used for the characteristic seaside trees, and for everything connected with sea saltiness: the essence of life. 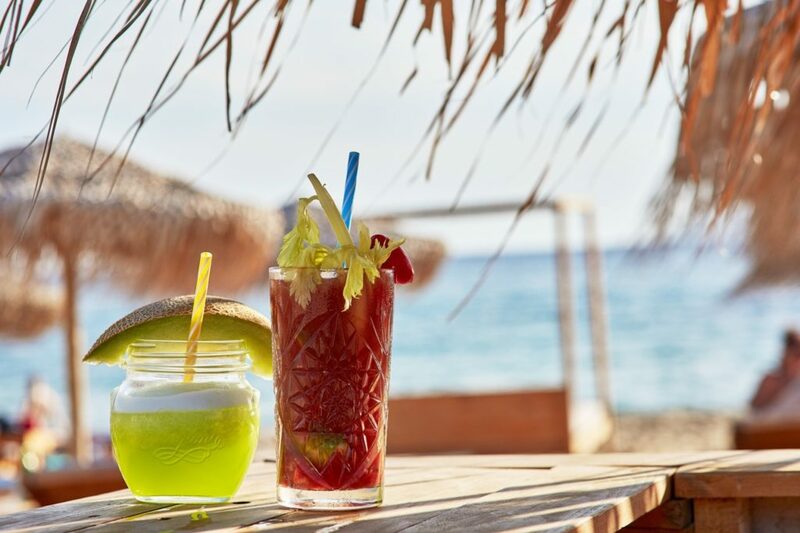 Almyra By the Sea, the well-known Dionysos Resort restaurant & beach bar, is welcoming its loyal friends that treasure the bohemian freedom of living by the sea. Inspired by the island’s unpretentious living and its breathtaking natural environment, we created a gastronomic haven on Mylopotas Beach, that offers delicious, creative cuisine in the comfort of outdoor joy. Welcome every new promising day with a fulfilling breakfast, enjoy a nourishing lunch, refresh with a cool snack and indulge in the calmness of a romantic dinner without moving from your hotel. Almyra By the Sea is the perfect spot to sip in easy-going, care-free summer life and the best way to start and end your day in Ios. The cuisine of Almyra By the Sea, is based on seasonal, great quality local ingredients: Local cheese, dairy and meat; fresh fish and delicious summer fruits, vegetables and herbs that come straight from our garden, are the starting point for the carefully curated menu of Almyra By the Sea restaurant, that creatively blends traditional Greek recipes with a modern twist. 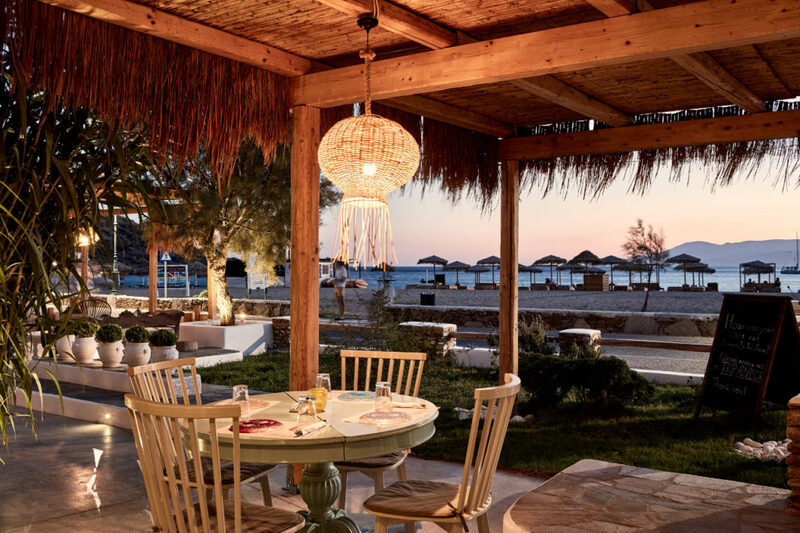 The stylish, relaxed seaside restaurant and bar as well as the comfortable Dionysos beach beds are ideal to indulge in the authentic flavors of Almyra By the Sea. Inspired by the smooth Cycladic breeze, the clearness of the sky and the crystal-clear waters of Mylopotas, we are proud to serve you breakfast and brunch by the sea. A wonderful way to start your day after a refreshing morning swim, Almyra By the Sea offers great choices for pure, comforting and delicious breakfasts that are enjoyed in the most amazing setting. 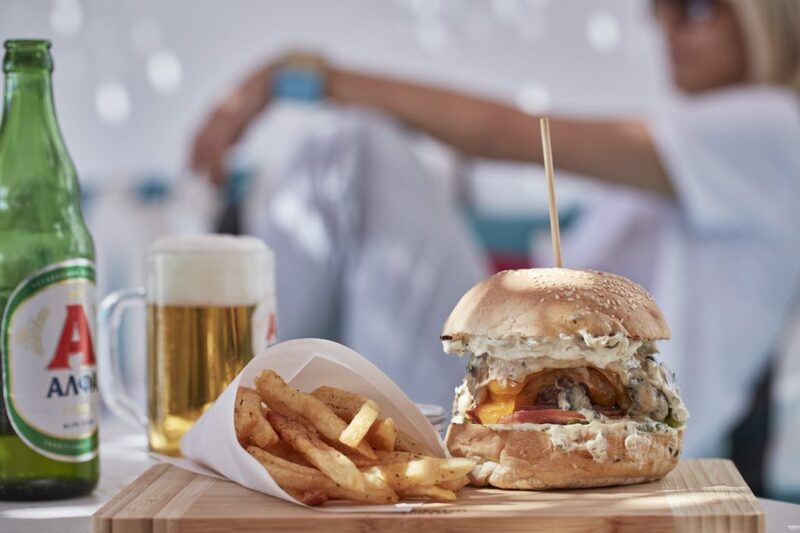 Snack-swim-sleep-repeat: We are open all day, to offer the most delicious, appetizing snacks as well as refreshing summer-inspired drinks or sweets and inspire you to get in touch with your most relaxed vacation mood. Exquisite creations, finger food and beverages, are served by the welcoming stuff of Almyra By the Sea. The magic hour of sea sunsets and the purple skies of summer evenings bring a romantic and serene sparkle at Almyra By the Sea. The welcoming ambience created by the emerging stars and the calming restaurant lighting is the perfect background to enjoy the restaurant’s cuisine. The menu of Almyra By the Sea restaurant, inspired by the freshness of local products and the creativity of Head Chef Steven, is introducing Greek and Mediterranean comforting flavors, with a contemporary, outgoing, joyful approach. Cocktails and beach, make a match made in heaven. The high-end Almyra By the Sea stylishly designed bar and a savvy mixologists team, accompanied with the breathtaking Mylopotas Beach, uplift this beloved summer combination. A sip of cool refreshing drinks, a sip of your own signature beverage, a sip of unforgettable moments… a sip of life by the sea: that’s the magic of a place created to offer relaxation and delight.